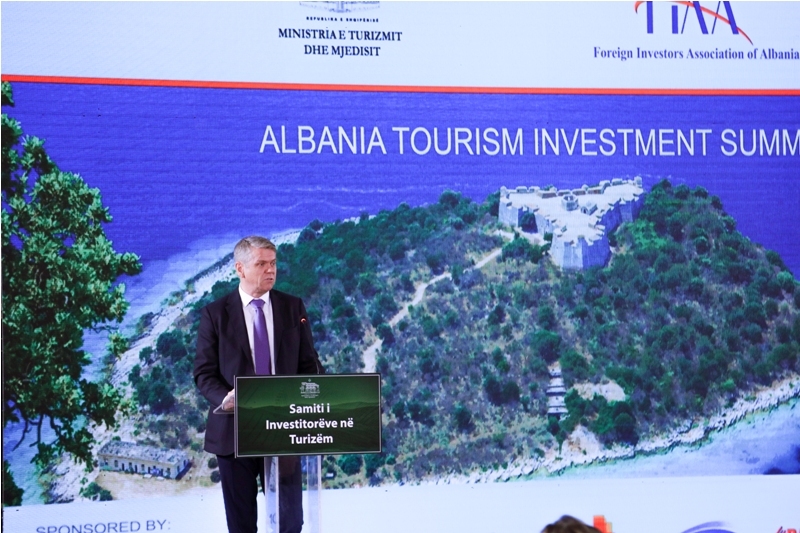 Albania Tourism Investment Summit, the Official Summit in the Albanian Tourism industry was launched in Tirana on 27th of November, organized by FIAA in close cooperation with the Ministry of Tourism and Environment and under the auspices of the Prime Minister of Albania. This Summit was an ideal opportunity platform for discussion on challenges and developments in tourism, for in-depth discussions, meeting national and international key players and experts, exchanging ideas and following up stimulating conversations around the next big trends driving this sector. The Summit brought together important stakeholders in the tourism industry from Albania and abroad, who find this country an excellent destination for the start of new tourism projects and approach of international Operators and Hotel Brands. FIAA’s Chairman Mr. Tom Kristian Larsen in the opening speech of the Summit said: “It is a great privilege to inaugurate the Summit, and I am very happy that we have been able to conclude on our initiative for an International Summit for Tourism Investment in Albania, after intense preparations over the last 6 months”. Download here Mr. Larsen Speech. The Summit noted the presence and high interest from global hotel Brands and Operators such as Marriott, Orbis and Accor Hotels Group, Best Western, Wyndham Group, Expedia Group and international Consultants. Minister of Tourism and Environment Mr. Blendi Klosi made an overview of the Tourism statistics and sector performance during the recent years. Furthermore, Mr. Klosi referred some international brand leaders in this sector who have seen Albania as a potential country for developing their activity. Brand names like Hilton, Marriott International, Melia Group, Hyatt Group today are a successful reality for Albania. A special message in the Summit was delivered from Prime Minister Edi Rama who highlighted the high influx of tourists who visited and continue to visit Albania. Mr. Rama presented concrete figures of the income generated by this sector of employment and the attention that the government is devoting to the further development of this industry. The Prime Minister presented the government’s vision for tourism where the construction of Hotels and Resorts and not just Real Estate or complex villa complexes will take great care. The prime minister invited foreign and domestic investors to invest in this sector. Distinguished national and international experts and representatives of hotel brands such as Marriot, Hilton, AccorHotels & Orbis Group, Green Coast, San Pietro Resort and Hysenbelliu Group, were speakers of the Summit.